There are many different types of horse breeds throughout the UK. Some are still very popular. Others have become quite rare. People love horses for many different reasons. The best task for the horse is often determined by its breed. 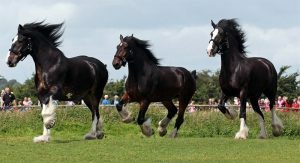 The heavy horse breeds of today are not utilized as much as a working horse, although there are still many instances where they do need to take on some heavy workloads. Many of the tasks they were once expected to perform have now been replaced with modern technology. Although there are still some farmers who use work horses on a smaller scale. There are some that find the cost of modern-day machinery to be too high. For them, they continue to use heavy horses to complete the work that comes naturally to them. They originally came from Scotland. The purpose of breeding them was to fulfil the needs of the Lanarkshire farmers. This breed is known to be active. They do enjoy being around people and are considered to be quite gentle. Many people refer to them as the “gentle giants”. The most common characteristics of their looks are the four white socks. Clydesdales are quite tall as their average height is about 16.2. This breed of horse originally came from France. Although it does date back to the ice age. It is a breed of horse known for its intelligence. Also, it doesn’t mind taking on heavy tasks. They can weigh up to 2,700 pounds. The Shire is a breed of horse that has been around for over a thousand years. This breed is recognized for both its strength and energy. Although the heavy work horse may not be in such big demand, breeding still holds an important role in the equine industry.